John Dezso Ratzenberger (born April 6, 1947) is an American actor, voice actor, and entrepreneur. He played Cliff Clavin in the TV show Cheers, for which he earned two Emmy nominations, and plays voice roles in Pixar Animation Studios' films, including Hamm in the Toy Story franchise, The Underminer in The Incredibles franchise, Mack in the Cars franchise. He is the only actor to appear in all of Pixar's feature films, and with minor appearances in major films such as Superman and The Empire Strikes Back, he is one of the most successful actors of all time in terms of box-office receipts. Born in Bridgeport, Connecticut, Ratzenberger began his entertainment career while living in London in the 1970s. He had minor film and television roles throughout the late 70s and early 1980s before creating, and then landing, the role of the know-it-all mailman Cliff Clavin on Cheers (1982–1993), a role he portrayed throughout the show's eleven seasons. His first Pixar role was the voice of Hamm the Piggy Bank in Toy Story (1995) and has voiced Pixar characters in films and video games ever since. From 2004 to 2008 he hosted the TV documentary series Made in America. Outside of acting, he has promoted American entrepreneurship and manufacturing, and campaigned for several Republican candidates. 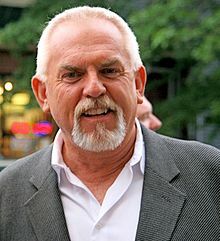 Ratzenberger was born in Bridgeport, Connecticut, the son of Bertha Veronica (née Grochowski), who worked for Remington Arms, and Dezso Alexander Ratzenberger, a Texaco truck driver. His father was of Austrian and Hungarian descent, and his mother was of Polish ancestry. He attended St. Ann's School in Bridgeport and Sacred Heart University in Fairfield, Connecticut. In 1969, Ratzenberger was a tractor operator at the Woodstock Festival. He moved to London in 1971 and stayed there for 10 years. Ratzenberger was a house framer living in London when he began his career in the performing arts. Through the 1970s, he performed with Ray Hassett as the comedic theatrical duo Sal's Meat Market, which toured across the UK. Peter Richardson and Nigel Planer as The Outer Limits and in The Comic Strip were heavily influenced by Sal's Meat Market. His first role was a patron in The Ritz (1976). Throughout the late 1970s and early 1980s, Ratzenberger appeared in various minor roles in major feature films, including Firefox; A Bridge Too Far, as Lieutenant James Megellas; Superman, as a missile controller; Superman II, as the NASA control man; Star Wars: The Empire Strikes Back as Major Derlin; Motel Hell as a drummer; Outland as a doomed mine worker named Tarlow; and Gandhi, playing an American lieutenant (Ratzenberger's voice was dubbed over by an uncredited voice actor). Ratzenberger played mail carrier Cliff Clavin on the sitcom Cheers. He had read for the part of Norm Peterson, but after the audition, he sensed that they were not going to give him the part. Sensing an opportunity, he asked if they had written a bar know-it-all, which the producers decided was a great idea. Ratzenberger also came up with the idea for Cliff's trademark white socks, which he wore as a tribute to French comedian Jacques Tati. Cliff became known for his outlandish stories of plausible half-truths, uninteresting trivia, and misinformation, and in general for being a pretentious blowhard. Cliff and Norm, the primary customer characters, became iconic bar buddies. Ratzenberger provided the voice for an animated version of Cliff on The Simpsons sixth-season episode "Fear of Flying". Ratzenberger was nominated for an Emmy Award for Outstanding Supporting Actor in a Comedy Series in 1985 and again in 1986. When Paramount Television licensed the look of the Cheers bar to the Host International subsidiary of Host Marriott Services for use in airports in the U.S. and New Zealand, the group also created animatronic barflies. They were called "Hank" and "Bob"; Ratzenberger and George Wendt claimed Hank and Bob resembled them, and in January 1993, sued Host for using their likenesses without permission. The case languished in court for eight years before all sides settled in 2001. Ratzenberger's tenure at Pixar was parodied during the end credits of Cars, where his character, Mack, watches car-themed versions of Pixar films (Toy Car Story, Monster Trucks, Inc., and A Bug's Life). Mack notes that all the characters Ratzenberger has played were excellent until he realizes that they are performed by the same actor, at which point he remarks, "They're just using the same actor over and over," and asks, "What kind of cut-rate production is this?!" His favorite of his Pixar characters was P.T. Flea, because "in real life, I always get a kick out of those kinds of characters, people who just go into a rage for [no] explicable reason. He was always on edge. His blood pressure was always way over the top, and everything that he did was done in a panicked state. So it was a lot of fun to play him." Although technically not Pixar films, Ratzenberger voiced Harland the jet tug in DisneyToon Studios' Planes (2013) and a mustached plane named Brodi in its sequel, Planes: Fire & Rescue (2014), both of which are set in Pixar's Cars franchise. Additionally, Ratzenberger will reprise his role as The Abominable Snowman on the Disney+-exclusive series Monsters at Work, which is set after Monsters Inc..
During season six of Last Comic Standing, Ratzenberger was a talent scout with his former Cheers co-star George Wendt. On March 2, 2007, he replaced Vincent Pastore (who had quit after one week of training) on the fourth season of the American version of Dancing with the Stars. He was partnered with professional ballroom dancer Edyta Sliwinska, who had been Pastore's partner; the two were the sixth couple to be eliminated from the show. On December 3, 2009, Ratzenberger appeared on an episode of American Chopper to help promote awareness of the Iraq Star Foundation. On June 26, 2011, Ratzenberger was asked by NASCAR to give the shouting command for the 2011 Toyota Save-Mart 350 at Sonoma Raceway. Ratzenberger accepted and gave the "Gentlemen, start your engines" command. On April 23, 2015, Ratzenberger appeared as a guest judge on the 14th season of Hell's Kitchen for an alcohol challenge, in nod to his role on Cheers. Made an appearance on British show Live from Studio Five (February 17, 2010). Appeared in television commercials for the Pitney Bowes personal post office, ended every commercial saying "Hey, I look good in red!" Reprised his role of Cliff Clavin in an episode of Frasier and - along with his Cheers partner, George Wendt - an episode of Wings called "The Story of Joe"
Will reprise the role of The Abominable Snowman in the TV Series Monsters at Work. Ratzenberger developed a packaging-alternatives product made from biodegradable and non-toxic recycled paper as a safe alternative to foam peanuts and plastic bubble wrap. This product was manufactured by his company Eco-Pak Industries, which he later sold. Ratzenberger co-authored We've Got it Made in America: A Common Man's Salute to an Uncommon Country (ISBN 1-931722-84-6), published in 2006. He also co-founded the Nuts, Bolts and Thingamajigs Foundation, dedicated to raising awareness among young people of skilled trades and engineering disciplines. In 2010, Ratzenberger became affiliated with and now represents the Center for America (formerly the Foundation for Fair Civil Justice) to further develop his work and increase awareness about the skilled worker shortage facing the United States and the changes needed to positively impact and increase the number of skilled workers. He joined as a board member in 2010. CFA is a 501(c)(3) nonprofit organization whose mission is to "educate, motivate, and empower the American people to understand they have the greatest stake in removing obstacles to a fair civil justice system, innovation, entrepreneurism, and job creation." CFA creates multi-media educational programs, publications, and website features that reach millions of Americans through radio, television, and the internet." In 2016, Ratzenberger launched thegiftbox.com, an e-commerce website that allows customers to subscribe to a variety of monthly boxes. Ratzenberger has two children, James John (born 1987), and Nina Kathrine (born 1989), both from a 19-year marriage to Georgia Stiny that ended in divorce in 2004. After dating for nearly four years, Ratzenberger married Julie Blichfeldt on November 6, 2012. Both Ratzenberger and Blichfeldt are described as "avid outdoors enthusiasts, philanthropists, and activists". Ratzenberger, a Republican, said he considered running for the U.S. Senate in Connecticut in 2012. During the 2008 presidential race, Ratzenberger campaigned for John McCain, appearing with former Cheers co-star Kelsey Grammer at several Republican party events. He also has been outspoken in opposition of the 2010 health care reform bill, referring to it as socialism. He endorsed Mitt Romney in 2012. He appeared on Your World with Neil Cavuto to support Donald Trump's candidacy during the 2016 presidential race, shortly after Trump was declared the presumptive Republican nominee. On January 17, 2010, he appeared and endorsed Scott Brown for the United States Senate at Mechanics Hall in Worcester, Massachusetts. Ratzenberger campaigned for Republican Josh Mandel of Ohio for the State Treasurer position during the 2010 election and on January 10, 2011, served as master of ceremonies for Mandel's swearing into office. In response to the 2012 Aurora shooting, he said "Hollywood has to, at some point, admit that what they produce does affect the minds of people.... If you just want to shock 'em... society will pay the price for that at some point." 1979 Secret Army Staff Sergeant Dexter Episode: "The Execution"
1980 ITV Playhouse Tom Phillips Episode: "Friends in Space"
Code Red Inspector Ray Allen Episode: "All That Glitters"
1982 Hill Street Blues Phony Cop Episode: "Some Like it Hot-Wired"
1983 Wizards and Warriors Archie Episode: "The Dungeon of Death"
1984 Magnum, P.I. Walt Brewster Episode: "The Legacy of Garwood Huddle"
1985 St. Elsewhere Cliff Clavin Episode: "Cheers"
The Love Boat Marty Elder Episode: "A Day in Port"
1987 The Tortellis Cliff Clavin Episode: "Frankie Comes to Dinner"
1990 Walt Disney's Wonderful World of Color Cliff Clavin Episode: "Disneyland's 35th Anniversary Celebration"
Wings Cliff Clavin Episode: "The Story of Joe"
1992 Nurses Mr. Hafner Episode: "Illicit Transfers"
1993 Moon Over Miami Norman Rust Episode: "Farewell, My Lovelies"
1994, 2014 The Simpsons Cliff Clavin / CGI Homer Simpson Voices; 2 episodes: "Fear of Flying", "Treehouse of Horror XXV"
1995 Murphy Brown Felix Episode: "A Rat's Tale"
1996 Caroline in the City Mr. Berman Episode: "Caroline and Richard's Mom"
1997 Happily Ever After: Fairy Tales for Every Child Hinky Voice; Episode: "The Pied Piper"
Sabrina, the Teenage Witch Bob/Santa Claus Episode: "Sabrina Claus"
The Detectives Edsel Episode: "Go West Old Man"
1998 Remember WENN Mr. Abernathy Episode: "And If I Die Before I Sleep"
2000 Touched by an Angel Merl Episode: "Monica's Bad Day"
2001 That '70s Show Glen Episode: "Holy Craps"
The Drew Carey Show Himself/Various Episode: "Drew Live III"
2002 Frasier Cliff Clavin Episode: "Cheerful Goodbyes"
2006 Rodney Himself Episode: "Celebrity"
2011 Melissa & Joey Arnie Episode: "A House Divided"
2013 Bones Bill Schumacher Episode: "The Cheat in the Retreat"
CSI: Crime Scene Investigation Stu Kirchoff Episode: "Torch Song"
2015 The McCarthys Charlie Ellis Episode: "Hall of Fame"
Hell's Kitchen Himself Episode: "11 Chefs Compete"
2017 Lego Star Wars: The Freemaker Adventures Major Bren Derlin Voice; Episode: "The Storms of Taul"
^ Alcorn, Stacey (April 2, 2016). "John Ratzenberger - American Made". Huffington Post. Retrieved January 30, 2018. ^ "Last Night's Dancing with the Stars: What You Didn't See". PEOPLE.com. ^ "The Ratzenberger Attic". Archived from the original on October 12, 2008. ^ a b Spelling, Ian (May 21, 2009). "John Ratzenberger, Pixar's good luck charm, on Up, Bugs and Toys 3". Sci Fi Wire. Retrieved May 22, 2009. ^ "Sal's Meat Market". Unfinishedhistories.com. Retrieved December 20, 2016. ^ Wilmut, Roger (1989). Didn't You Kill My Mother in Law?- the story of alternative comedy in Britain from the Comedy Store to Saturday Night Live. UK: Methuen. p. 58. ISBN 0-413-17390-9. ^ a b The Joe Cook Program (Radio). July 26, 2012. http://joecookprogram.wordpress.com/2012/07/26/john-ratzenberger-interview/ Retrieved July 29, 2012. ^ "Nominees/Winners". Television Academy. Retrieved January 30, 2018. ^ "Norm and Cliff Fight Cheers Robots". go.com. ^ "Disney's "Planes" Hi-res Stills, Fun Facts and Activity Sheets". Stitch Kingdom. May 9, 2013. Archived from the original on June 30, 2013. Retrieved May 11, 2013. ^ "Planes Fire & Rescue (2014)". British Film Institute. Retrieved August 24, 2014. ^ "Look! Up in the sky! It's an exclusive peek at 'Planes'!". USA Today. ^ "'Dancing' adds Cliff from 'Cheers'". CNN. Associated Press. February 20, 2007. Archived from the original on March 4, 2007. Retrieved March 2, 2007. ^ "The Village Barbershop". thevillagebarbershop.com. Retrieved April 2, 2018. ^ "Cheerful Goodbyes". Frasier. Season 9. Episode 21. April 30, 2002. OCLC 124055292. NBC. ^ "'Monsters, Inc.' Voice Cast to Return for Disney+ Series (Exclusive)". The Hollywood Reporter. Retrieved April 9, 2019. ^ "Early recruitment: Foundation draws youth to careers in manufacturing". Industrial Engineer. May 2009. p. 12. ^ a b "John Ratzenberger – Fiddlers Bay Productions". ratzenberger.com. ^ a b "foundationforfairciviljustice.org". Archived from the original on November 19, 2010. ^ TheGiftBox.com. "Actor John Ratzenberger Launches TheGiftBox.com". www.prnewswire.com. Retrieved January 18, 2017. ^ a b "John Ratzenberger weds Julie Blichfeldt". UPI. November 30, 2012. Retrieved September 19, 2014. ^ Rachel E. Stassen-Berger (November 5, 2009). "Pawlenty draws wallets fat ... and famous". Minneapolis Star Tribune. ^ John Ratzenberger and Kelsey Grammer greeted McCain supporters, called voters on behalf of the Republican ticket, participated in voter-registration activities at the local campaign headquarters, and held a McCain victory rally in Henderson, Nevada. "Political emissaries descend on valley: Richardson, Grammer rally voters at events". Las Vegas Review-Journal. October 11, 2008. Retrieved October 16, 2008. ^ "Stars stump in Las Vegas Valley". NBC-affiliated KVBC website. October 11, 2008. Retrieved October 16, 2008. ^ "Tea Party activists hit the Hill, arrested outside Pelosi's office". CNN Political Ticker. November 5, 2009. Retrieved November 5, 2009. ^ "'The Only Candidate for Me': Pixar Icon Throws Support Behind Donald Trump". Fox News Insider. May 11, 2016. Retrieved November 18, 2016. Wikimedia Commons has media related to John Ratzenberger.